Prepare all of the ingredients ahead of time. Cooking is very fast and you want your vegetables very crisp. Dovetailing Tip: Save leftover stir fry to use on day 5, in place of the vegetables in the Egg Foo Yung. 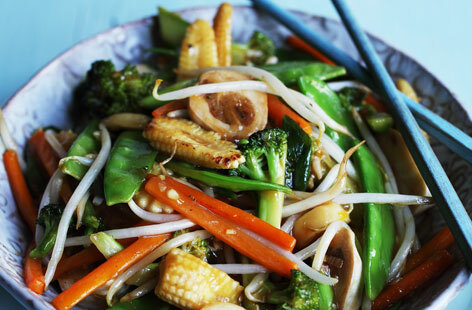 Heat the oil and sesame oils in a wok until very hot, add the garlic, ginger, and then stir-fry for one minute. Add the remaining vegetables and water chestnuts and cook for a further 2 minutes. Mix the soy sauce in a small bowl and stir in the corn starch to create a smooth paste. Stir the mixture into the vegetables, together with the rice vinegar and stock. Stir-fry for a further minute or so, until the liquid has thickened and the vegetables are glazed but still crisp. Serve immediately.